The rapid development of nanotechnologies worldwide has fostered intense studies regarding the safety of engineered NP. PANDORA aims at identifying the effects of NP on the immune responses of environmental organisms. The rapid development of nanotechnologies worldwide has fostered intense studies regarding the safety of engineered NP, which enter in an increasingly larger number of consumers’ products and industrial applications and are released into the environment. The effects of NP on human health are actively studied also in relation to the development of nanomedicine. The immunosafety of NP is a major issue for human health, because of the possibility that NP, even if not directly toxic, may alter the functionality of immune cells thereby posing significant health risks. Environmental nanotoxicology, on the other hand, has dedicated little/no attention to the effects of NP on the immune responses of environmental species. Defensive immune responses are present in practically all living organisms and some of the basic mechanisms are remarkably conserved throughout evolution, in particular those of the so-called “innate” immune system. 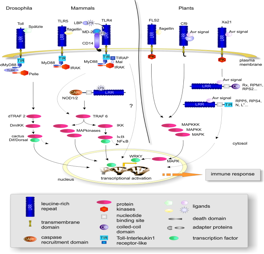 Pathogen-sensing receptors such as the human Toll-like receptors (TLR) are practically identical to invertebrate Toll receptors, and to the pathogen receptors found in plant cells. Innate effector molecules (antimicrobial peptides, degrading enzymes, complement) and innate effector cells (phagocytes) are practically identical in most living organisms. The study of the immune response, integrated with ecological, evolutionary and population biology information, has led to the development of one of the most rapidly expanding fields of biology, Ecological Immunology (Rolff J. and Siva-Jothy M.T. Invertebrate ecological immunology. Science 301: 472, 2013), which examines the impact of environmental stressors on the immune response and how these stresses maintain the variation in the immune function in the context of evolution and ecology. The importance of defensive mechanisms (that ensure survival but also physical fitness and consequently reproductive capacity) underlines the need of assessing the effects of NP on the immune response of environmental organisms.